Nightstalker doesn't follow the Richard Ramirez serial killer facts too closely. But that's not what this film is about. This is history told as a horror film. Indeed, as a religious parable. We see Ramirez's killings through his own eyes. 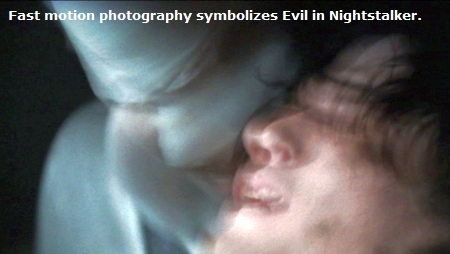 He stalks and kills his victims while an albino Satan with a blood-stained mouth flashes about him, head shaking quickly. Ramirez himself flashes about the scene. It's a series of killings seen through the eyes of an insane drug addict. It sets the mood of Evil. It works. Evil is the theme, to the point of religious parable. Ramirez not only sees Satan, he orders his victims: "Say you love Satan!" He tells Satan: "I did it for you!" Naturally, his apartment abounds in upturned pentagrams, written in blood. Ramirez's nemesis is Rosalyn Sanchez, who plays an East L.A. cop -- who's also a devout Catholic. She prays ferverently every night, the camera hovering in extreme closeup about her quivering lips, her tightly clutched rosary, focusing in and out at the aged crucifx she prays before. Sanchez is surrounded by encroaching evil. Her black police lieutanent boss sexually harrasses her. His head shakes quickly (as does Satan's head), thus linking him to Evil. Sanchez's Latino partner snorts coke in the squad car, his head shaking quickly. Sanchez's white partner turns vigilante, his head shaking quickly. The Evil is everywhere, in all races. All three men behave in a mostly decent (if roughshod) manner throughout the film. None of their indescretions are followed up plotwise. Rather, the Evil just lurks there, surfacing on occassion, but always beneath the surface of those Sanchez might trust. The Evil lurks in women too. Sanchez is betrayed by a gal reporter, who uses Sanchez as a source, then breaks confidence, exposing Sanchez as her source. Sanchez had given a police sketch of Ramirez to the reporter, hoping it would save lives. Sanchez's motives were pure, but the reporter didn't care about saving lives, only making a name for herself; exposing Sanchez saved no one, but made the story juicier. The reporter also snorts coke, her head shaking quickly. Sanchez has other problems. Her aging mother is senile, a burden on Sanchez, who's turned down better job offers to stay in East L.A. and care for her mother. These problems are additional crosses for Sanchez to bear as she prays to Jesus. The Evil is everywhere. The film is set in 1985, and TV sets throughout the film carry newscasts of crises in the Mideast, the poison plant leakage in India, US support of Saddam, and the Ramirez killings. No, this is not a "true crime" film. It's shot in the aesthetic style of a horror film, and it's about a devoutly Catholic woman seeking divine help in her fight against Evil. Sanchez is the moral core of this darkening universe as Evil encroches on her from all directions.